Zopeo helps you to find people from anytime in your life, no matter where they are – all in one place.Whether you’re trying to find your friends, reconnect with a lost loved one, stay in contact with family, or keep track of the dozens of other relationships you’ve created along the way, ZOPEO is here to help you do it. 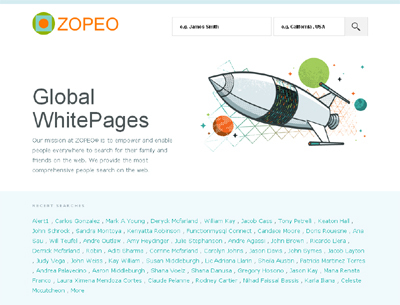 ZOPEO is the most effective and efficient way to find everyone in your life. The main selling point of this site is that it’s capable of finding deep web pages that can’t be found by any other regular search engine, or that can be found only by applying lots and lots of different filters. Searches on the site are executed by supplying the name of the person to be found, and the place where he is actually located. Searches take just a couple of seconds to be carried out.